Choosing the right timber species for your gates. Wooden timber gates are an aged proven material of which today many gateways are made from. The question I get asked most days is which timber species should we use to make our gates from. Well there are two sides to the answer of this question of which there has to be a compromise between the two to derive the correct result. What is the over all theme of the property from fence colour to windows,doors and general exterior joinery. Versus, the correct timber species to hold the finish required to obtaine the desired theme and look. Paint,stain,Varnish,oil and natural weathered are the four main stream finishes customers go for. Iroko, Sapele,Oak, Idigbo, Accoya(Modified softwood) and softwood are the main timber species used in the manufacture of wooden gates. The next question is which one do you use on which finish. To understand the above and end up at some type of conclusion that is based on fact and experience you have to look at the structural qualities and behaviour of the different timbers. 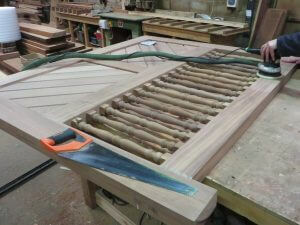 Starting with iroko as the obviouse leader in finishes with it being perfect for an oil finish. Iroko is naturally an oily timber which lends it self perfectly towards the use of oils like Teak oil and Osmo Oil. Idigbo is a respectable all rounder for Paint and stain finishes as long as the hight Tannin level is taken into consideration with which type of finish you apply. Both Oak and Sapele are two to watch out for with in the wooden gate manufacturing industry. These two timbers are prone to movement which will allow water ingress on revealed cracks or exposed areas of untreated wood. A great deal of thought has to go into which type of stain or paint to use on Oak and Sapele. You would require one that is more forgivable on movement and that has a good vapour breathable membrane. personally I would stick to Oiling Oak with teak oil knowing you will end up with the silver grey period look and leaving Sapele for interior use only or even in the rack as for me too unstable. Accoya is one of the best timbers to use for any the of Finnish as it is extremely stable and has a Fifty year guarantee against rot above ground. It paints really well (Again with the correct paint system) and can be stained if you choose the correct unmarked stock. Softwood for me is a non starter if you are considering to fit a set of gates that are going to last any period of time. To conclude Iroko and Accoya are the two leading timbers when choosing what to use when ordering your gates. Followed by Idigbo as a steady second all rounder. Obviously there are other factors to take into consideration in more depth regarding the finishing of these timbers , for example end grain sealants, biocide preservatives and different brands and paint manufacturers. 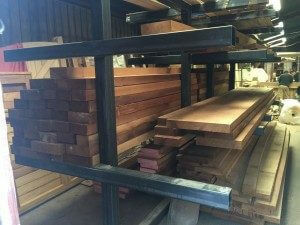 Over all these handful of timbers are the main considerations when thinking about ordering gates. There are other materials and more timber species that can be looked at, but I find these are the ones looked at more commonly. Please use the enclosed link for more information on these materials.